A label was approved today for Sixten, a new canned (!) beer from Sly Fox Brewing down in Royersford. The label describes it as “a working-class farmhouse ale for the working class”. It’s a good thing they snagged this up considering Goose Island, now owned by commercial swill beer conglomerate Anheuser-Busch InBev snagged up the 215 beereacode (new term, just created) back in July to presumably brand their 312 Urban Wheat to be city-specific. 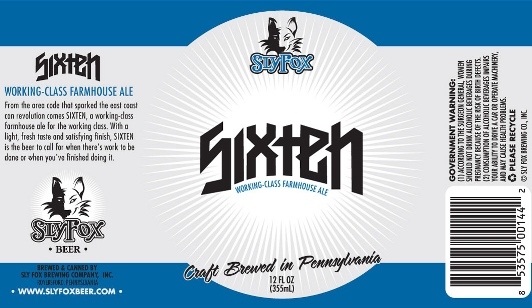 No word on when the Sly Fox Sixten will be available, but we’re decently excited about this. Considering their other canned offerings like Pikeland Pils, Phoenix Pale, and Oktoberfest, this will make a great addition for throwing back at tailgates, summer outings, backpacking, etc. For all of you with a 484 area code, well you’re just not important enough.